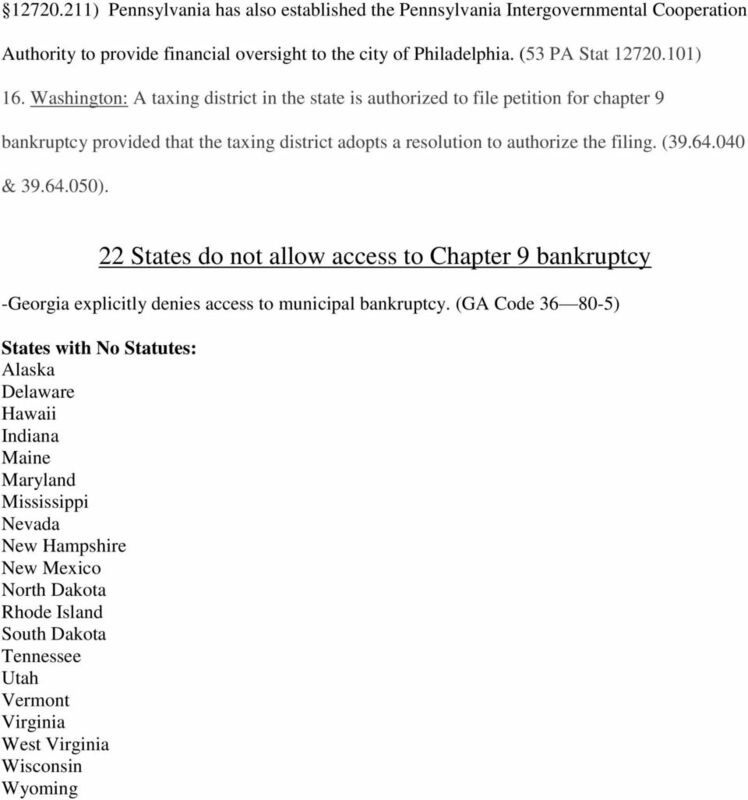 Download "22 States do not provide access to Chapter 9 Bankruptcy"
4 10. 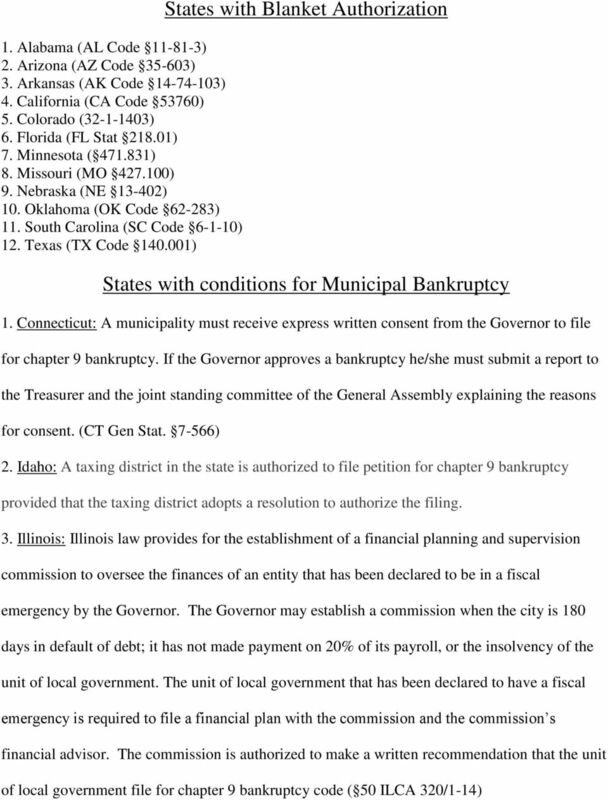 New Jersey: The Municipal Finance Commission must approve both the filing of the bankruptcy petition as well as any plan of adjustment. Once the Municipality has been in financial default to bondholders or noteholders for more than 60 days, the commission may intervene to manage the financial affairs of the municipality. NJ Gen Stat ( 52:27-40) 11. New York: New York authorizes a municipality, emergency financial control board to file for adjustment of municipal indebtedness (NY CLS Loc. Fin & 85.80). New York City must get authorization from the New York State Financial Control Board to file for bankruptcy. 12. North Carolina: Requires pre-approval by the Local Government Commission (State Treasurer, State Auditor, Secretary of State, Secretary of Revenue, and five appointees). (NC Gen Stat 23-48) 13. Ohio: A taxing authority must file a petition with the tax commissioner stating that they are insolvent and unable to meet their debts and that they would like to file a plan for readjustment of debts. The tax commissioner must approve the request to file for bankruptcy. 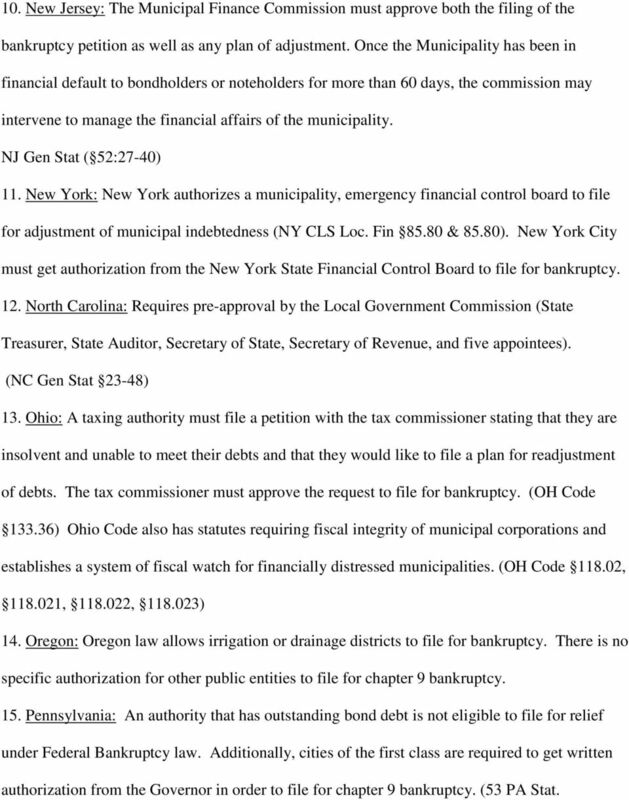 (OH Code ) Ohio Code also has statutes requiring fiscal integrity of municipal corporations and establishes a system of fiscal watch for financially distressed municipalities. (OH Code , , , ) 14. Oregon: Oregon law allows irrigation or drainage districts to file for bankruptcy. 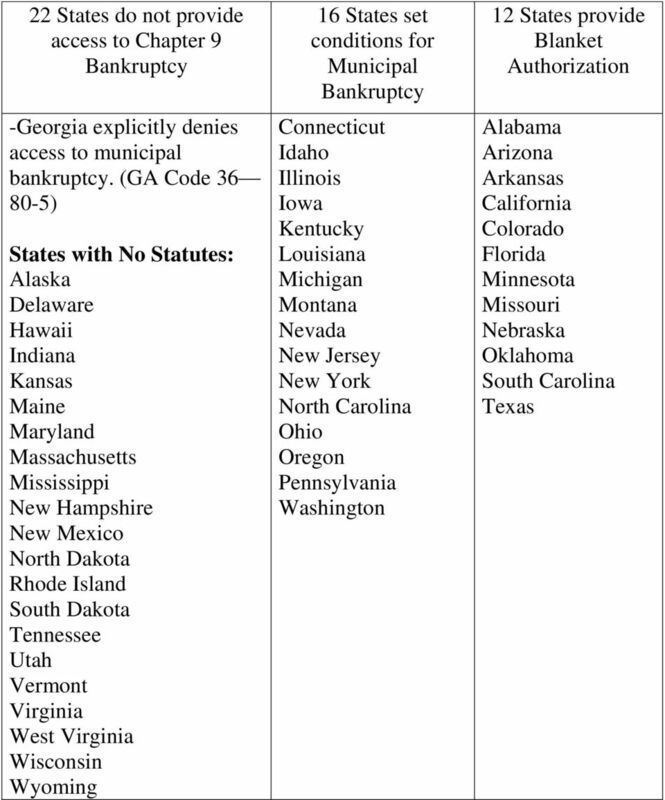 There is no specific authorization for other public entities to file for chapter 9 bankruptcy. 15. Pennsylvania: An authority that has outstanding bond debt is not eligible to file for relief under Federal Bankruptcy law. 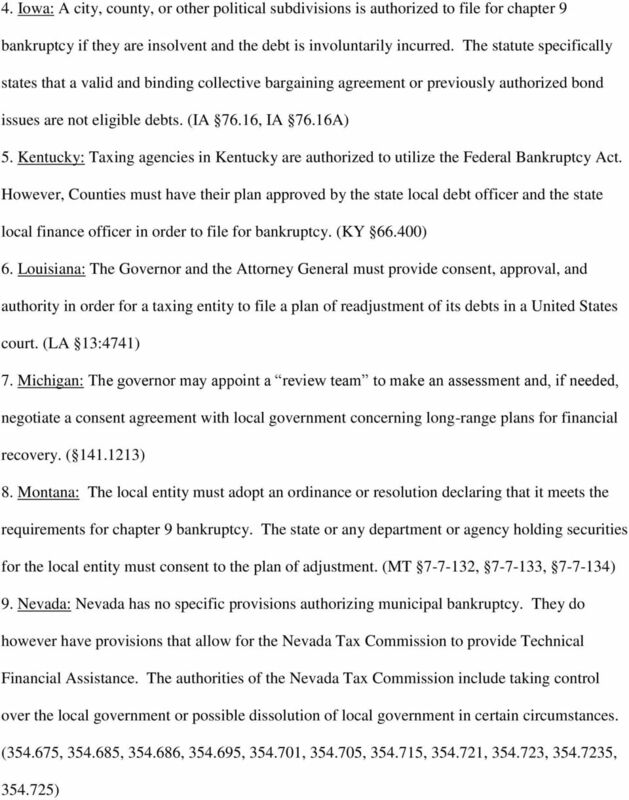 Additionally, cities of the first class are required to get written authorization from the Governor in order to file for chapter 9 bankruptcy. (53 PA Stat. Alabama Ala. Code 5-25-5 Bond only required where licensee does not submit evidence of net worth. Loan originators may be covered by Alaska 25,000 Alaska Stat. 06.60.045 Arizona $10,000-$15,000 Ariz. Rev.